The world is full of incredible plants with a wide range of Impressive health benefits. Many of these plants have been used for hundreds of years to treat a variety of conditions. Modern medicine is now beginning to investigate the use of many of these traditional folk remedies with surprising results. One plant with a very long history of medicinal use is hawthorn or crataegus monogyna. Studies done to date have demonstrated that the plant has a number of potential uses especially when it comes to heart health. This article will take a close look at the benefits of this amazing plant and how you should go about using it. Crataegus monogyna, commonly known as hawthorn or common hawthorn, is a species of the hawthorn plant. It is a member of the rose family and a native of Europe, Western Asia and northwest Africa These days it can be found in temperate climates all round the globe and it is sometimes regarded as an invasive weed. The plant has long been used in China as a an anti-inflammatory and a digestive aid but these days, it is becoming better known for its positive effects on the heart. The very first recognized study into the effects of hawthorn on the was conducted in the late 19th century but its use as a remedy for ‘dropsy’ goes all the way back to the Middle Ages. Over the past few decades, there has been an increase in interest in the heart health benefits of Crataegus monogyna and a growing number of studies have been conducted into its effects. As well as its heart health uses, hawthorn is also used to treat digestive health, anxiety and menstrual issues. All parts of the plant are used to make medicine, these include the roots, leaves, flowers and berries or ‘haws’. These days, hawthorn is readily available in supplementary form including capsules and tinctures. Crataegus monogyna contains a number of healthy compounds with antioxidant, anti-inflammatory and antiseptic properties. It is a good source of folic acid and vitamin C which can help boost the immune system. Hawthorn also contains a number flavonoids and phenolic compounds including rutin with antioxidant and anti-inflammatory properties. The procyanidins which give the berries their color are also a great source of antioxidants. The plant also contains catechins and saponins as well as various minerals including calcium and iron. The main health benefits for hawthorn are related to the heart. To date, there have been a number of studies into the effects of the plant on congestive heart disease as well as its effects on blood pressure, cholesterol and angina. Hawthorn has been well-researched to determine its effects on heart health. Many of the studies to date suggest that the plant has potential to reduce symptoms of congestive heart failure. However, there are other studies that have failed to demonstrate a benefit. According to the studies done to date, hawthorn can help reduce many of the symptoms of heart disease including fatigue and shortness of breath as well as helping to improve exercise tolerance. 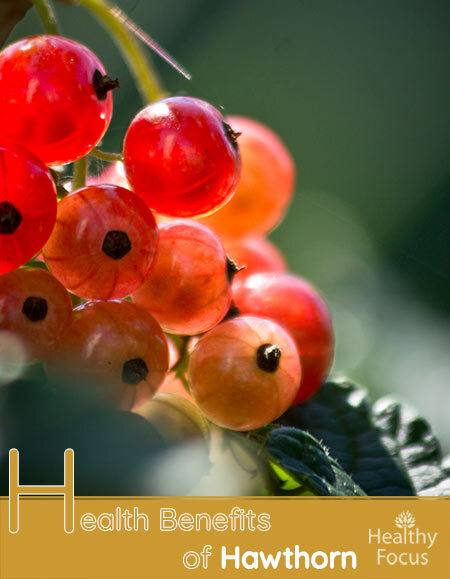 Several studies have also revealed that crataegus can help reduce blood pressure naturally. Hawthorn extract causes a relaxation in the blood vessels allowing them to dilate which helps promote blood flow. One clinical trial published in 2006 looked at the effects of the Crataegus laevigata species of hawthorn on blood pressure. The trial involved 79 patients with type 2 diabetes with high blood pressure. Half of the subjects were given hawthorn extract daily for 16 weeks while the other half were given a placebo. High total cholesterol and LDL cholesterol levels are a major risk factor in heart disease and stroke. There is an increasing interest in natural remedies for high cholesterol and several animal studies suggest that hawthorn may be of use. There is also evidence from a limited number of trials that hawthorn extract can help treat patients with angina improving their cardiovascular health and reducing the risk of atherosclerosis. Hawthorn is a rich source of antioxidants which are known to contribute to anti-inflammatory actions. This means the flavonoids and other compounds found in hawthorn could help treat a range of inflammatory issues. Hawthorn is available in several supplementary forms including powders, capsules and tinctures. The leaves and the fruit can also be used to make a medicinal tea or infusion. To prepare a hawthorn infusion, add two teaspoons of the crushed leaves and fruit to one cup of boiling water then allow it to steep for around 20 minutes. You can drink one or two cups a day. Supplements are available in capsule, tablet and tincture form. The most effective dosage is not known but studies have used a range of doses between 160 and 1800 milligrams taken in three divided doses throughout the day. The most studied extract is a standardized extract called WS 1442 which contains up to 20% oligomeric procyanidins. Hawthorn extract is known to act slowly so it may take between 4 and 8 weeks before you know whether you will benefit. The dosage used in clinical studies varied according to the condition being treated. Please consult your doctor to decide on the appropriate dose. What are the side effects of Hawthorn? The majority of studies done into hawthorn so far have found it to be well tolerated in the doses used in the study. However, there are a number of potential side effects including headaches, dizziness, fatigue, nausea, agitation, palpitations, sweating, stomach upset and insomnia. Hawthorn can act as a natural diuretic. It can help to reduce the build-up of fluids and improve symptoms associated with congestive heart disease. Research has found that hawthorn extracts can increase the production and excretion of urine. Can hawthorn berries be eaten? All hawthorn berries are edible regardless of which species of hawthorn.They are often used to make jams and jellies and can also be used along with other parts of the plant to make a therapeutic tea. However, the berry seeds contain tiny amounts of cyanide and should not be eaten. Hawthorn is considered to be safe in the recommended dose for up to 16 weeks. Clinical studies have found that it is largely well-tolerated and did not cause any serious side effects. However, hawthorn has been known to cause a number of less severe side effects including palpitations, headaches, sweating, nausea, dizziness, nosebleeds, stomach upset and agitation. Large doses of crataegus monogyna can lead to low blood pressure and cardiac arrhythmia. Pregnant women and breastfeeding moms should avoid using hawthorn supplements. According to studies, hawthorn can improve the effectiveness of certain heart medications but can interfere with others. It is therefore important that you speak with your doctor before taking this supplement. People taking blood pressure medications should only use hawthorn under their doctor’s supervision.